Our three-stage treatment model incorporates both DBT and trauma focused interventions to both treat the addiction and resolve the deep-rooted psychological issues that frequently underpin such disorders. The Dialectical Behavioural Therapy (DBT) Addiction programme at Clarity is designed to treat the most entrenched addictions and self-destructive behaviours. DBT is used to tackle treatment resistant disorders that frequently result in high levels of relapse and reinstatement of drug and alcohol abuse and problem behaviours. 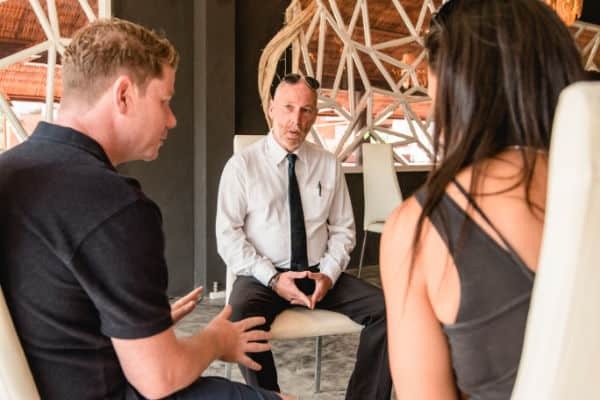 At Clarity our unique programme is designed by Psychologists specializing in addictions and treatment resistant disorders. We deliver the most up to date treatments for addiction and trauma informed dependency problems. Our treatment is renowned for its effectiveness. We are simply put, experts in the field of addictions and we let credentials speak for us. Three phases of treatment. Each clearly defined. Each evidenced based. Each delivered by experts. Clarity’s three phase treatment programme (Discovery, Resilience, Resolution) provides clients with research driven, cutting edge information as to the underlying causes of addiction. During the Discovery phase clients complete intensive stress management and neurocognitive classes that detail the extent of their addiction whilst beginning to develop strategies to overcome it. During the Resiliency phase of the programme delivers distress tolerance workshops and groups to teach clients techniques. In conjunction with this we deliver targeted psychotherapy (DBT) to both increase resiliency and develop new problem-solving strategies and radical acceptance. Without confronting the most common thinking errors that define addiction or treating the inability to live life on life’s terms most addicts will frequently relapse. At Clarity we use only recommended evidenced based clinical treatments to move beyond victim-stance thinking and empower clients to regain their passion for life. In the Resolution phase we address the adverse life events that have shaped the addictive personality and core beliefs across the lifetime. Addicted lives are traumatized lives by very nature of how the disorder forces people to conduct themselves over time. The rigours of an addiction destroy both individuals and families and decimate self-esteem. Over the lifetime of the disorder traumas begin to accumulate and by virtue of the chaotic lives most addicts lead, these complex traumas can come to define the individual. Without treatment the underlying persona continues to seek relief from both the emotional pain and the intolerable crisis of thinking errors that define day to day life. The historical impact of childhood adversity combined with the intolerable stress that addiction brings is overwhelming for many. At best they continue to drink or use. At worst they seek respite in self-destructive behaviour or suicide. During the Resolution phase of treatment, we deliver only psychologist led intensive trauma therapy that comprises Trauma Focused Group Therapy, Trauma Release Exercise (TRE), Mindfulness Based Stress Relief (MBSR) and Eye Movement Desensitization Reprocessing Therapy (EMDR). Clients attend Trauma Focused Groups each day combined with daily individual trauma sessions with a fully licensed therapist in the afternoons. If you or a loved one needs help, we are available to help 24/7, whatever the circumstances.